Lewis Institute Tae Park Mid-South Tae Kwon Do Association recently held a organization seminar. The seminar was taught by Kwan Jung Nim 7th Dan Black-Belt Junior Grand Master Dennis Lewis. Accompanying Junior Grand Master Lewis was Master Instructor Terry Warmath, Master Instructor Terry King and Master Instructor Betty Henderson. The seminar focused on several key topics. The seminar was held from 10 am–2 pm with constant movement and participation the whole time. The seminar was held at The Milan Y.M.C.A. in Milan, Tennessee. Junior Grand Master Lewis charged a fee of $20 per student which he donated all of it back to The Mid-South General Fund to help and aid students and families with various events and trips. The seminar was a huge success. Junior Grand Master Instructor Dennis Lewis recently traveled to Anniston, Alabama to teach a special class and to judge testing . The Head Instructor in Alabama is Mr. Marcus King a longtime student of Junior Grand Master Lewis. Accompanying Junior Grand Master Lewis was Mr. Connie Elam who is The Head Instructor of The Tiptonville, Tennessee School. The following day color-belt testing was held in Alabama with Master Bruce Park Jr. from Knoxville, Tennessee attending along with some of his Black-Belt Students. Junior Grand Master Dennis Lewis recently traveled to The East Tennessee Knoxville Area for Master Bruce Park’s Jr. Mid-South Tae Kwon Do Testing. Accompanying Junior Grand Master Lewis was Master Terry Warmath from Paducah, Kentucky. Junior Grand Master Lewis talked to all of the students about several upcoming events in Tae Park Tae Kwon Do and World Class Tae Kwon Do and everyone were very proud and happy. The testing went very well. Mr. Burt Cox, 3rd Dan with the Central Studio in Jackson has lost his mother (Lela Theola Cox). She will be missed by many and our thoughts and prayers go out to his family and friends. It is with a sadden heart that I pass on the information that Master Huong Tran’s grandfather passed. He had been ill for a short time and he was 104 years old. In his younger days he had practiced Martial Arts in his native country of Vietnam. He will be missed by many and our thoughts and prayers go out to his family and friends. Our Tae Kwon Do Family has lost a loved one who will be deeply missed. Laura Sefton is a Red belt in Good Institute and her grandfather, Retired Army Colonel George William “Bill” Sefton, was a D-Day paratrooper and advertising executive, brother, father and great grandfather to many. He will be missed by many and our thoughts and prayers go out to his family and friends. Please click on the links belong to read about Mr. Sefton. Lewis Institute Tae Park Mid-South TKD Association recently held color-belt testing and their annual Christmas Dinner. The testing and dinner was December 12th and it was held at The Mayfield Elementary School in Mayfield, Kentucky. About 200 students, families, and friends were present at this event. Also in attendance were representatives from The Hugs Program which is a program that sends care packages to our U.S A. Servicemen who are serving our country in Iraq, Afghanistan, and other locations around the world. Junior Grand Master Lewis and The Lewis Institute Youth Group under the direction of Master Betty Henderson and Mrs. Melissa Haley are proud supporters of this organization along with several other worthy organizations such as St. Jude’s Children Hospital, Nate’s Wish just to name a few. The Hugs program representatives were very appreciative of the items and they gave a heartfelt thank you to Junior Grand Master Lewis and The Lewis Institute Youth Group. They presented Junior Grand Master Lewis with a nice plaque in appreciation. After the testing Junior Grand Master Lewis’s students showered him with gifts and well wishes and then there were the annual Christmas dinner. After the dinner as a Tradition Junior Grand Master Lewis wore a Santa Hat and passed out gift bags of candy to all of the kids and some grownups. Everyone was very proud and happy and it was a really good day. Lewis Institute organization testing student group photo. Lewis Institute Annual Christmas Dinner. Lewis Institute recently held a organizational seminar and testing. The event took place in Tiptonville, Tennessee. There were a host of Students, Friends, Family, and Instructors from all over The Mid-South who are members of Lewis Institute Tae Park Mid-South TKD Association. Junior Grand Master Instructor Dennis Lewis hosted the event. Special Guests were Grand Master Tae Zee Park President & Founder Of Tae Park Tae Kwon Do, Grand Master Richard Warren Vice-President of Tae Park Tae Kwon Do and President Of World Class Tae Kwon Do and Junior Grand Master James Rodgers President Of Rodgers Institute and Central Studio Head Instructor for Tae Park Tae Kwon Do. Grand Master Park, Grand Master Warren and Junior Grand Master Rodgers all taught with precision and accuracy. The Lewis Institute Youth Group collected baseballs that were signed by all of the Grand Masters, Junior Grand Masters, and Masters to send to the U.S.A. servicemen in different parts of the world. They also send food and other supplies. The masters pictured from left to right are: Master Betty Henderson, Grand Master Richard Warren, Grand Master Tae Zee Park, Junior Grand Master James Rodgers, Master Terry Warmath, Junior Grand Master Dennis Lewis, Master Robert Jones, Master Terry King, and Master Bruce Park Jr. The young man pictured between Grand Master Park and Junior Grand Master Lewis is Mr. Micah Haley who is The Lewis Institute Youth Group President. The following group photos are were taken at the event. to communicate a couple referee training opportunities. continuing and stopping a match. How to issue penalties and award and announce match winners. you arrive with plenty of time to check in and prepare for test. Please click on image below to see the testing details. Wednesday, March 25th 2015 Tae Park Taekwondo Master Aaron Lindstrom presented a case before the United States Supreme Court in State of Michigan vs Environmental Protection Agency. A decision in the case is not expected until late June. Master Lindstrom currently lives in Grand Rapids and has been a part of Tae Park Tae Kwon Do organization since 1981. TPTKD salutes Master Lindstrom. Lewis Institute of Tae Park Mid-South Tae Kwon Do–Youth Group gathered at the recent testing, which was also the Christmas Party, to humbly present over 100 blankets to ‘Nate’s Wish’ a great and worthy cause. ‘Nate’s Wish’ was created to provide encouragement to children newly diagnosed with cancer. Nate died at the tender age of 10 from cancer and his wish was to help ill children from all walks of life obtain backpacks, blankets and other personal articles. On November 6, 2014 GRCC Ford Fieldhouse in Grand Rapids Michigan USA hosted the annual Black Belt testing for Tae Park Tae Kwon Do. Over 90 new ranks of Black Belt were tested on their skills in forms (poomsae), sparring and breaking. The event was attended by Grand Master Tae Zee Park and Grand Master Richard Warren, Junior Grand Master Lynn Bernard, Junior Grand Master Mark Good, Junior Grand Master Robert Barss, Junior Grand Master James Rodgers and Junior Grand Master Dennis Lewis. There were also a host of Senior Master Instructors present as well as Masters. Congratulations to all those who tested as they achieve and improve their new level of Black Belt. Grand Master Richard Warren, WCTKD President, father passed away at the age of 96 on Tuesday September 16, 2014. The family is planning a private service. Sponsorship opportunities are now available for the June 21, 2014 Meijer State Games of Michigan Taekwondo Tournament as well as the Tae Park Taekwondo 2014 World Class Championship Tournament. Both tournaments will be held in Grand Rapids, Michigan. Sponsorship of these world class events is a great way to provide visibility of your business to a large number of individuals which includes spectators and participants of both events. At the Jackson Y Center their be a Referee Seminar conducted by Master Matthew Klingbeil, Master Lemon Williams, and Master Dr. Rachael Harshbarger. Masters are encouraged to join also. Students who are green belt and above and sixteen years of age are recommended for this class. Please tell your student who may be coming to bring all of their sparring gear with them. There will be no charge for the class. Dr. Brad Mutchler was recently honored with the Distinguished Veteran of 2013 Year Award. Dr. Mutchler served over seas from 1966-1967 and he also served in Desert Storm in 1991. The dinner and ceremony was held in Paducah, Kentucky. There were several officials present and The Media was present also. 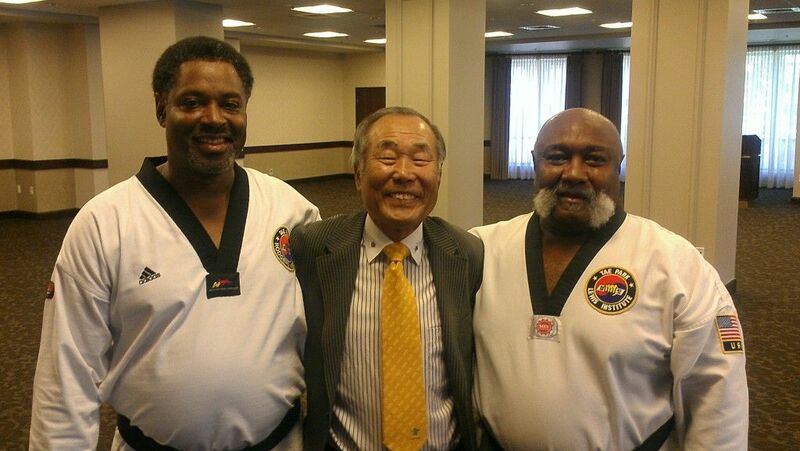 The event was attended by Dr. Mutchler’s Instructor Mr. Charles Caldwell and Kwan Jung Nim Junior Grand Master Dennis Lewis. Junior Grand Master Instructor Dennis Lewis and Master Instructor Terry Warmath recently gave a basic self-defense class for some members of Mr. Marcus King’s Church in Alabama. The class was focused on knowing your surroundings, using common sense, and basic vital parts and points used in self-defense. Mr. King’s church has been very supportive of Lewis Institute of Tae Park Tae Kwon Do since Mr. King’s classes started in August of 2013. Everyone was very interested and they were shown basic life saving techniques that anyone of any age could do. Recently the Lewis Institute Youth Group collected toys and crafts for St. Jude Children’s Hospital/Memphis TN, Le Bonheur’s Children’s Hospital/Memphis TN, and Nate’s Wish/Nashville TN. The Group was successful in collecting and donating over $3,000 worth of toys and craft items to donate to the three organizations. Pictured are Micah Haley, President, Bailey Jackson, Vice President, Chris Bell, Secretary, Master Betty Henderson sponsor. Not pictured: Colin Hulme, Secretary. ALONG WITH OUR VERY DISTINGUISHED SPECIAL GUESTS GRAND MASTER TAE ZEE PARK AND GRAND MASTER RICHARD WARREN THERE WILL ALSO BE A HOST OF SEVERAL JUNIOR GRAND MASTER, SENIOR MASTER, AND MASTER INSTRUCTORS PRESENT AT THIS GREAT EVENT. Note: The cost of the seminar package is $70.00 PER STUDENT which includes 5 authorized and approved Tae Park Tae Kwon Do Boards and a Certificate Of Participation included with the cost. The boards can be picked up at the seminar. SPECIAL NOTE: Basic classes will consist of White Belt thru Green Belts and advanced classes will consist of Blue, Red, and Black-Belts. This works best for us and it just makes everything simple for the students and the instructors. 8:00a.m.—8:45a.m.—-Board pick-up and distribution— The boards can be picked up from Senior Master William Golombisky at Dyersburg State Community College in Dyersburg, Tennessee. 9:00a.m.—10:30 a.m.—–Grand Master Tae Zee Park will teach to all Master Instructors in The Special Aerobics Room. 9:00 a.m.—-Unlimited Time—–Grand Master Richard Warren will start intense interview with New Master Instructor Candidates.—-Note: This is tenative depending on if Sa Bum Nim allows New Master Instructors Testing either in Tennessee or anywhere else in the country. 10:30a.m.—–11:30a.m.—–Master James Heglund and Master Lemon Williams will be teaching and discussing tournament rules and regulations to All Master Instructors in preparation for future Tae Park Tae Kwon Do Tournaments and Upcoming Michigan and Tennessee State Games. This class will take place in The Special Aerobics Room. 12:30p.m.——5:00p.m.—–MASTERS, SENIOR MASTERS, JUNIOR GRAND MASTERS TEACHING. Note: On Friday March 14th each group will have various time periods. Parents can be included in each group session. We will have about 2-3- minutes to change classes and please try and stay on schedule but please be understanding if a student has to go to the bathroom, or is sick etc., etc. Please do not punish the student with push-ups, etc.etc. Note: Also if a particular Instructor is teaching please do not interrupt the Instructor. Please let the Instructor teach his or hers respective class. This is just being PROFESSIONAL. 6:30 P.M.—-8:00 P.M.——Tae Park Tae Kwon Do National Organizational Black-Belt Testing—1st, 2nd, 3rd Dan Testing. Note: If Sa Bum Nim decides and approves Master Instructors Testing then we can have both testing going on at the same time. The Black Belt Testing will be in the gym and The Possible Master Instructors Testing can take place in The Special Aerobics Room with Sa Bum Nim’s Approval. If there is a Master’s Testing then it will be a CLOSED TESTING. Sa Bum Nim and Grand Master Warren will select and appove the judges. This will consist of various topics and discussions with Sa Bum Nim. This conference will be conducted by Grand Master Richard Warren. The Master’s Conference will take place at The Dyersburg State Community College Student Commons Center On Campus. Refreshments will be served. No Alcohol. Note:THIS IS FOR MASTER INSTRUCTORS ONLY. SATURDAY MARCH 15TH 2014 SCHEDULE OF EVENTS. 8:00 a.m.—–Unlimited Time—-Grand Master Richard Warren will Continue Intense Interview With New Master Instructor Candidates. 1:00 p.m.—-3:00 p.m.—-MASTERS, SENIOR MASTERS, JUNIOR GRAND MASTERS TEACHING. Note: The party will be held on campus at Dyersburg State Community College Student Commons Center. The Seminar Package is $70 PER STUDENT. Note: The Seminar Package will include 5 approved Tae Park TKD Boards And Certificate Of Participation at this Great Event. The boards can be purchased from Tae Park Products and can be picked up from Senior Master William Golombisky on March 14th 2014 from 8:00 a.m.—-8:45 a.m. at Dyersburg State Community College. Tae Park Peoducts will donate $1 from every board sale to World Class Tae Kwon Do, Inc. our non-profit organization in order to help individuals and students for Travel & Academic Scholarship Suupport. Please make checks payable to Tae Park Tae Kwon Do. On November 8th 2013 Grand Master Tae Zee Park concluded his organizations Black Belt testing for 2013 in Grand Rapids Michigan at the Gerald R. Ford Fieldhouse. Over 50 Black belts from over 20 Institutes completed the process of obtaining their new level of Black Belt Dan. The event was Directed by Senior Master William Golombisky and was followed with a special Masters Meeting attended by over 30 of Grand Master Parks’ Master Instructors. ready to present at the competition. Tae Park Rodgers Institute is having a fundraiser to make a donation to World Class Taekwondo and to buy some well needed equipment for our dojang and to be able to help finance students to go to Tae Park Taekwondo events in the following year. Ann Cunningham, a Rodgers Institute student, has hand made a beautiful quilt made up of several organization t-shirts and their patches that were donated, thanks again for those donations. The quilt took a lot of extra time and energy on her part to construct. It truly is a one of a kind quilt. There will be a drawing the day of the tournament for the quilt just before lunch and tickets are available now at $10.00 per ticket. For tickets and information please ask your instructor to contact JGM Rodgers anytime. Tickets will be available the weekend of the WCTKD tournament. Click on this link to see the flyer for the raffle. On September 28th Junior Grand Master Lewis’s students surprised him with a Thank You Poster for his hard work and dedication in preparing everyone for The State Games Of America that was recently held in Harrisburg/Hershey Pennsylvania. I was really surprised and honored that they really did appreciate all of their accomplishments said Junior Grand Master Lewis. On Saturday, August 24, the West Michigan Tae Kwon Do Association black belt testing was held in Grand Rapids, MI. The event was hosted by Junior Grand Master Mark Good and his organization. In attendance was Grand Master Tae Zee Park (Ann Arbor MI) and Grand Master Richard Warren and Junior Grand Master James Rodgers of Jackson Michigan. Testing included poomsae, sparring and board breaking and the event was followed with a dinner at Applebee. Hello to everyone and how are you? I would like to talk about the National Congress Of State Games that was recently held in Harrisburg/Hershey Pennsylvania. There was a total of about 350 competitors from about 40 states. Tae Park Tae Kwon Do was well represented. There were about 25-30 Tae Park Tae Kwon Do students from Tennessee, Kentucky, Michigan, and Missouri along with a host of family and friends. Also there were Masters Heglund, Warmath, Sanderson, King, Henderson, and Nabhan present also. I was really surprised at the lack of organization. The tournament did not have any schedule for people to see. There was no Opening Ceremony, Lunch Period, Demonstration, etc., etc. Students, Friends, and Families started arriving at 8 a.m. and our group left at 9 p.m. and they were not finished even at 9 p.m. One of the referees told me that all of the corner judges had only had very limited training the night before the tournament. There was not any kind of Dress Code for the corner judges. Grand Master Park (Sa Bum Nim) has been telling us for years how a high quality and high caliber tournament was supposed to be conducted. Our tournament usually consists of 400-600 competitors each year and in my opinion we just get better and better at it. I think that we need to really focus on Tae Park World Class Championships in November and Tae Park National Seminar in March. We need to continue the Friendly, Family, and Traditional Values of the type of Tournament and Seminar that Sa Bum Nim has been teaching us for years. All of the Tae Park Tae Kwon Do Parents told me how much that they are proud to be a part of Tae Park Tae Kwon Do and World Class Tae Kwon Do. Once again Tae Park Tae Kwon Do was well represented in Pennsylvania. All together we won about 30-40 medals and they definitely knew who we were. Even The Dae-Do Technicians knew who Tae Park and Tae Park Tae Kwon Do was. I can see why we are considered 1 of The Top 3 Tae Kwon Do Organizations in The World and The Number 1 Traditional Organization in The World. Thank you Sa Bum Nim for teaching us the right way and we are all very proud of always being a part of Tae Park Tae Kwon Do and World Class Tae Kwon Do. Thank you sir. I took Young Lee to State Games of America, which was held at Harrisburg, PA on Saturday, 8/3/13. Young’s master instructor, John Sanderson, came there to support Young. While we were there, we met several people associated with Tae Park Taekwondo including Junior Grand Master Lewis. We were very glad to see familiar faces and Tae Park Taekwondo patches on the uniform. We appreciate your effort that you worked very hard to have American people like Taekwondo and participate in big events. From participation of these events, we learn from each other. One thing we could do better (I think) is to do board breaking by children (for example, jump over side kick). If we can add more excitement to the children, we will be able to grow more. Some people are quick. In general young people are quicker. So if we can cultivate quick young people to demonstrate and teach children one or twice a month, it will be a good incentive to attract children. 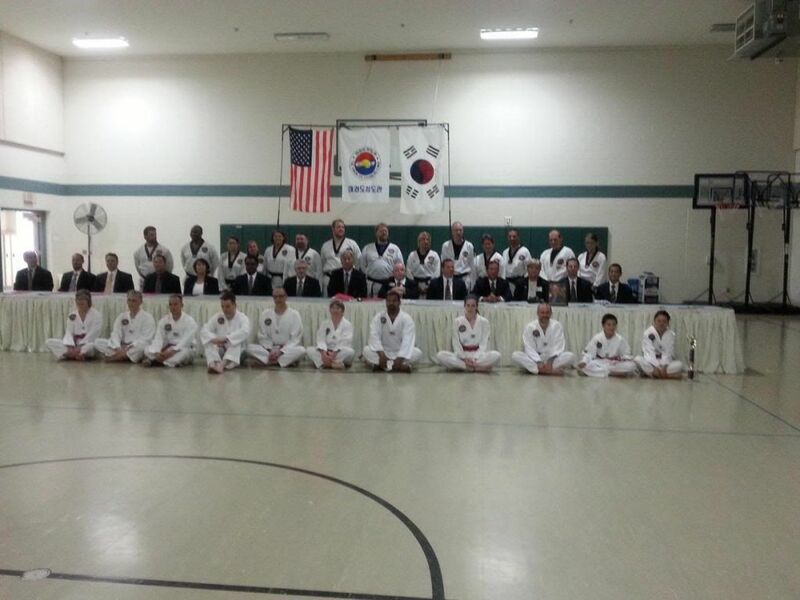 NMTPTKD, lead by Senior Master Golombisky held a color and black belt test on August 10th in Ionia. The test was successful with many color belts plus 7 students promoting to 1st dan and 3 promoting to 2nd dan. We would like to thank the judges that attended the test. 9th Dan – Grand Master Park, 7th Dan – Junior Grand Master Lewis, 6th Dan – Senior Master May, 5th Dan – Master Lucas, 5th Dan – Master Warmath, 4th Dan – Master Vora and new 4th Dan – Master Feurstein. This test will be held on October 12, 2013. There will be a 12:00pm – Masters Conference followed by a 1:00pm – Black Belt and Color Belt Testing. The tesing will be held at the Jackson YMCA with a very special guest, the President and Founder of Tae Park Tae Kwon Do, Grandmaster Tae Zee Park. Julie Dejnozka a Tae Park TKD 1st Dan from Sanderson Institute has been accepted to the Military Institute in New Mexico for her freshman year to be followed up with her second year and following at the United States Naval Academy in Annapolis, Maryland. Junior Grand Master Instructor Dennis Lewis, Master Terry Warmath, Master Terry King, and Master Betty Henderson along with students from Lewis Institute Tae Park Tae Kwon Do Mid-South Tae Kwon Do Association recently traveled to Knoxville, Tennessee for a testing hosted by East Tennessee Master Instructor Bruce Park Jr.
A special seminar was taught for the students by Junior Grand Master Lewis! Benefit for Junior Grand Master Good. WCTKD-Ensing-Lofquist Institutes of Tae Park Taekwondo hosted a Benefit dinner on July 13th in honor of Junior Grand Master Mark Good. This event was a very special tribute to a man who has dedicated his life to taekwondo and now needs the help and support of his fellow martial artists. The Benefit was attended by over 100 persons from Tae Park Tae Kwon Do Institutes across Michigan. Saturday was also a black belt testing at the central studio in Jackson Michigan and the judges of that testing made the trip up for the Benefit! Thank you for your support Grand Master Tae Zee Park, Grand Master Richard Warren, Junior Grand Master James Rodgers and Master Valerie Lucas. What dedication and respect! The event featured grilled chicken, our chiefs of the day–Master Don Ross and Gary Lofquist grilled to perfection! A wide array of food was prepared by Master Constance Ensing and her Instructors, Master Susan Lofquist, Mrs. Rita Carmody, Mrs. Maureen Carmody, Mr. Erik Veen and Mrs. Karen Benchek. Many thanks goes out to all those who attended and worked for this event. A Silent Auction will be underway until the end of August with donated goods and services! Master Kerry McCarthy is heading up this and more information will be coming to keep us all posted on its progress! NEW Dae Do Training is here! This training will take place on Saturday, June 15th from 9:00 am to 1:00 pm at the following location. We will need some students to where the armor and “spar”. CONGRATULATIONS TO NEW BLACK BELTS AND NEW MASTER INSTRUCTORS OF TAE PARK TAEKWONDO!! Larry Feuerstein tested to 4 Dan with Master Terry Warmath promoting to 5 Dan. on display at the reception. It was a wonderful celebration for a great couple. Pic 1/2, From left to right: Master Terry Warmath, Groom-Master Terry King and Junior Grand Master Dennis Lewis. Pic 2/2, From left to right: Ms. Jacqueline Evans(Junior Grand Master Lewis’s longtime girlfriend), Junior Grand Master Dennis Lewis, Bride-Mrs. Denise King, Groom-Master Terry King,Mrs Holly Scribner and Master Terry Warmath. Click on the this link for details about this upcoming event. This site will provide you with details about registration, hotels and the Visitor Bureau. This testing will be conducted at the Jackson YMCA on January 19th, 2013 starting at 3pm. The nex testing will be held on March 30th, 2013 at 3pm at this same location. Junior Grand Master Good and Mr. Huong Tran conducted a class in Rochester, NY on Friday from 6pm to 8pm for all students and 8 pm tp 9pm for black belts. On Saturday 12-12, they had class from 9am to 10am followed by a testing from 10:30 to noon. Two of the judges; Mr. Klingbeil and Mr Wrona viewed the testing over the internet. Following the test high belt class was held until 2pm and then some students were allowed to stay for a invitation only class until 4pm. National Seminar’ will be on March 15-16, 2013 in Dyersburg Tennessee. a training/refresher class prior to the upcoming tournament! above, and green belt, you may join. Please wear your uniform and bring all of your armour. let me know. Please pass this information to your instructors and students. These individuals will be responsible for sending information about events that are happening withing their institute to the web stie team to be uploaded. TAE KWON DO: State testing, competition held in Milan, TN September 29, 2012.
by YMCA staff and volunteers from Central Studios of Tae Park Tae Kwon Do. Please bring any scrap metal in for the cause. CONGRATULATIONS to new 7th Dan’s Junior Grand Master James Rodgers and Junior Grand Master Dennis Lewis!!! On June 22nd, 2012 Junior Grand Master James A. Rodgers, Head Instructor for Tae Park Taekwondo and Instructor at Central Studio, along with Junior Grand Master Dennis Lewis, President of Lewis Institute of Tae Park Taekwondo, and Pioneer in the Southern Region, Tested for 7th Dan Junior Grandmaster in the City of Grand Rapids, Michigan at the Marriot Courtyard Downtown in the banquet room, Just a day before the State Games of Michigan. TENNESSEE STATE GAMESTae Park Tae Kwon Do will be the official sponsor for The Tae Kwon Do Competition for The State Games Of Tennessee. This will be the first time that Tennessee has had a State Games since 1994. At this time tae kwon do and fencing will be the only offered events. Special Guest will be Grandmaster Tae Zee Park President and Founder Of Tae Park Tae Kwon Do Of The United States Of America. We are very excited about this opportunity and I am very excited about the opportunity that this presents to Tae Park Tae Kwon Do. I received the Official Sanction Letter today. Also there is a possibility that we will have Color-Belt and Black-Belt Testing on Thursday September 27th in Tennessee and Color-Belt Testing on Friday September 28th in Kentucky. I will be letting everyone know about hotel information and the exact schedule very soon. Mr Richard Warren today set history on his testing at the Kukkiwon for 8th Dan. He has practiced for close to 40 years. He is one of the Original Students. He is the Vice-President of Tae Park Tae Kwon Do and also the President of the Board of Directors for World Class Tae Kwon Do, LLC. Grand Master Tae Park had spent several days of special instruction with Mr Warren in preparation for this test. This is a first for us and not an easy accomplishment. The expense of money is large, more than you can imagine, and the time and energy is not small. Mr Warren has devoted a large part of his life to Tae Kwon Do, Tae Park Tae Kwon Do, the development of the Art, and to Grand Master Park and his teaching methods and style. He did a physical test. A “Real Test” unlike some who do a “Political Test”. A Real Test involves preparing oneself by knowing the technique and being able to use it in the form. No hesitation. No miss of any kind. There is one required form and three more that the judge’s panel can select one or two or all three. One shot at each one. One miss, even the slightest, and failure will take place. There is also a paper or report to write and an interview at the judge’s choice. Now think about the time just for the test. 14+ hours of flight time. Strange land, food and water, and hotel. Arrive one day before the test. Jet lag? No time for that. The whole time in Korea is basically part of the test. And then there is the money which is close to $10,000 total for this. Then fly home the next day and back to the USA. Mr Warren was presented with his 8th Dan Chung Do Kwan Certificate from Grand Master Woon Kyu Uhm. Grand Master Uhm and Grand Master Park are both extremely proud of Mr Warren’s accomplishment. Keep in mind he could not have done this without the instruction and support of Grand Master Park. So all the of these gentlemen are very happy. Mr Richard Warren should now be addressed as Grand Master Warren or Warren kwan jung. Congratulations Sir! CONGRATULATIONS to new 8th Dan Grand Master Richard Warren!!! He was presented with his CDK 8th Dan by Grand Master Uhm this week and will receive his Kukkiwon certificate in November at the Tae Park World Class Championships’!! Grand Master Park and Junior Grand Master Warren Travel to the Kukkikwon. Or pay at the event. On April 21, 2012 a color belt testing was held in Grand Rapids MI. Attending as invited judges were, Master James Heglund of Ada and Master John Sanderson of Ypsilanti MI. There were 35 test candidates ranging in rank from white belts to low red. High score was a tie between Michelle Brown-Instructor Ms Sinclair/Lofquist Institute and Katherine Holmes-Instructor Mr Costa/Lofquist Institute. Master Heglund addressed the crowd in reference to the importance of basic stances and your TKD. He also promoted the upcoming Meijer State Games of Michigan which he is the tournament director for taking place on June 22-23, 2012. Thank you for attending our testing Master Heglund and Master Sanderson! 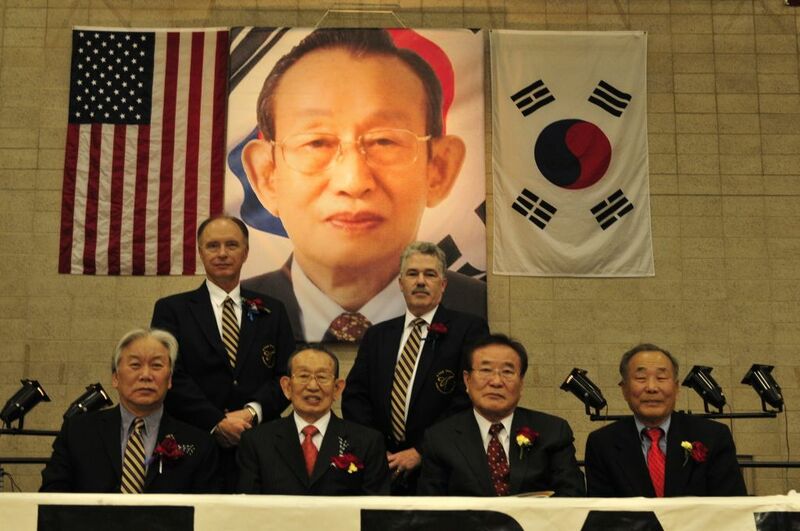 On November 12, 2011 Tae Park Tae Kwon Do was honored by the presence of Grand Master Woon Kyu Uhm. His arrival from Seoul, Korea was a much anticipated event and the whole organization was privileged by his acceptance of our invitation. The annual Tae Park Tae Kwon Do tournament had an unprecedented attendance of 542 participants from the states of New York, Kansas, Tennessee, Kentucky, Missouri and, of course, Michigan. With an opening ceremony inclusive of ‘cultural dance of the USA’ and special demonstrations of forms and breaking performed by the Tae Park Tae Kwon Do Demonstration team led by Mr. Lemon Williams. A special tribute and gifting was presented to Grand Master Woon Kyu Uhm. He was accompanied by fellow Grand Master Nam Suk Kim and Grand Master Woo-Yup Yang during this trip to Grand Rapids, Michigan. Grand Master Woon Kyu Uhm held conferences with Junior Grand Masters, Senior Masters and Master Instructors to share his wisdom and knowledge of this great marital art. His visit was too short and we wish that this great man could have spent more time sharing his insights. We were truly honored by his visit, teachings and presence. The testing is scheduled for June, 2012 in Grand Rapids, Michigan.